Burn Time Enterprises LLC - Your #1 source for alternative fuel! Burn Time Enterprises is the leader in wood pellet sales and largest alternative heating supplier in the state. Our product line includes anthracite coal, ash vacuums, barbeque pellets, horse bedding, eco bricks, bio bricks, and more. Our Early Buy is on now! We have an extensive variety of wood pellet brands, in stock and ready for delivery or pick up. Bio Bricks, anthracite coal, seasoned firewood, Energy Logs, and more, available for delivery or pick up. Premium pine pellet and wood shaving bedding for horses, pigs, and other animals. Clean-burning and cost stable home heating alternative made of renewable substances. Used in freestanding stoves, fireplace inserts and, furnaces. Environmentally conscious, economical solution to heating. One ton of our BioBricks® brings as much heat into your house as a cord of wood. One of nature's cleanest burning solid fossil fuels and carbon sources, anthracite produces virtually no smoke or polluting emissions. Our courteous professionals will deliver directly to your driveway or garage. 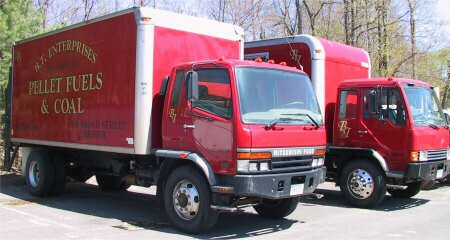 To schedule a delivery please call 860-410-0747 or contact us online. You folks really rock. The delivery was on time, placed perfectly in our garage as we requested and was without a hitch. Your staff is knowledgeable about the products and has as always, provided us with detailed information that has helped us maximize our enjoyment of our wood stove and saved us considerable time and expense. We’ve purchased the bio bricks and eco bricks from BT in the past and we love both products. Your pricing is better than any other supplier I know of and nobody, I mean NOBODY in my experience has a better staff or customer service than you all. BT’s service and reliability is second to none. We’ll be back next year for sure. Thanks for all your help and KEEP UP THE GREAT WORK! Feel free to come visit us if you'd prefer to pick up your fuel or you'd like to see our selection in person. For other information please call our Bristol Office at (860) 410-0747 during office hours. To schedule a pickup or delivery or contact us with any questions, please call us at (860) 410-0747 or contact us online using this form.